What's a Good Debt-to-Income Ratio (DTI)? How Does a Debt Relief Program Work? Survey: What Would You Do To Get Out of Debt? Of all the states that garner acclaim for uniqueness, Michigan doesn’t always get the recognition it deserves. It’s the only state that consists of two peninsulas. It borders three of the five Great Lakes. It operates the busiest international commercial crossing between the U.S. and Canada. The state is even shaped like a hand, or “mitten” — a detail not only serving as an easy way for natives to communicate their origin, but also a novelty icebreaker in a conversation with an outsider. In the very center of that mitten is Michigan’s capital city — Lansing. ‘The Heart of Michigan’ carries a population of 117,400 and a cost of living index of 84.3, compared to the U.S average of 100. Despite a favorable cost of living, population has fallen from 131,403 in 1970. The median home value in 2016 was $79,200, up just $6,000 from 2000, and the median household income of $40,160 is $12,000 lower than the median across Michigan. Factor in Lansing’s median gross rent of $801, and it’s clear that many Lansing residents may barely be getting by — especially with high-interest debt in the picture. There can be severe emotional side effects when our lives are dictated by debt. We’re also hindered from pursuing life goals like getting married, buying a home, having kids or starting a business. To put yourself in the best mental and physical state going forward, understand your debt relief options. Debt management plans (DMP), or credit counseling services, are for debtors with mild-to-moderate levels of debt. Enrolling in a DMP requires you to make one monthly payment to a company, which then distributes that among your creditors in a way that pays back the most principal as possible. Most DMPs and credit counselors charge a nominal monthly fee for their service. However, having the peace of mind knowing you’re on a track to pay off your debt might be worth the fee in itself. Other benefits of DMPs include financial education and protection from creditor collections. Trying to pay back a hefty credit balance is one thing, but when you’re juggling multiple balances and varying interest rates, the process becomes considerably more difficult. Thankfully, Lansing debt consolidation strategies like a balance transfer, personal loan, or leveraging your existing mortgage could help you climb get out of debt. A balance transfer moves several debts to one credit card with a zero or low-interest introductory period, usually ranging from six-to-18 months. Balance transfers carry a fee (usually three-to-five percent) but allow debtors to simplify their repayments and allocate more money toward their principal balance during the introductory period. In some cases, the introductory period might be enough to pay back the entire balance. Also called a debt consolidation loan, a personal loan helps pay off all your credit balances and maintain only one repayment. However, unsecured personal loans have widely varying interest rates (five to 36 percent!). Explore personal loan offers from lenders whom you’re not already engaged with to get the best terms on your deal. While the median home price in Lansing is just $79,200, if you have a lot of your mortgage paid off, you could use it to get out of debt. Your options are either a home equity loan or cash-out refinance. A home equity loan involves taking a second mortgage on your home — often at a fixed rate for up to 30 years. A cash-out refinance pays off your original mortgage and creates a new, larger mortgage with completely new terms. When debt management plans and consolidation strategies are no longer in grasp, debt settlement (aka debt relief, debt forgiveness, etc.,) can change a debtor’s circumstance. Freedom Debt Relief has resolved over $9 billion in debt over the years through tailored debt-relief methods. If you’re not only looking to get out of debt but also looking for support so you don’t hate to bear the burden alone, engaging in debt settlement makes a lot of sense. Debt settlement services will carry a fee if you agree to pay the reduced debt sum, take anywhere from two-to-four years to play out and will impact credit scores. But at the same time, debtors considering settlement likely already have decimated credit scores and have limited options to explore. Despite Lansing’s economic struggles the past few decades, certain strongholds give it a certain assurance of future vitality. The state of Michigan employs over 14,390 people in Lansing, and the pride of the town, the Michigan State University Spartans, account for another 12,781 positions. Other large employers include Sparrow Health Systems (7,600 employees), and General Motors (4,549 employees). Additionally, four national insurance companies make their headquarters in Lansing. With as hearty as college (read: Spartan) pride as you’ll find in the country and a bevy of stable government jobs that can lead to greener pastures, Lansingites have bright futures ahead. But before a life can be built, debt needs to be in the rear-view mirror. 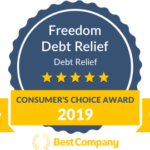 Learn more about how the Freedom Debt Relief process works, or if you’d like to speak with someone over the phone about your personalized options, feel free to give us a call seven days a week at 800-910-0065. Find out how our program could help. *Clients who make all their monthly program deposits pay approximately 70-75% of their original enrolled debts over 24 to 60 months. Not all clients are able to complete their program for various reasons, including their ability to save sufficient funds. Our estimates are based on prior results, which will vary depending on your specific enrolled creditors and your individual program terms. We do not guarantee that your debts will be resolved for a specific amount or percentage or within a specific period of time. We do not assume your debts, make monthly payments to creditors or provide tax, bankruptcy, accounting or legal advice or credit repair services. Our service is not available in all states and our fees may vary from state to state. Please contact a tax professional to discuss potential tax consequences of less than full balance debt resolution. Read and understand all program materials prior to enrollment. The use of debt settlement services will likely adversely affect your creditworthiness, may result in you being subject to collections or being sued by creditors or collectors and may increase the outstanding balances of your enrolled accounts due to the accrual of fees and interest. However, negotiated settlements we obtain on your behalf resolve the entire account, including all accrued fees and interest. C.P.D. Reg. No. T.S.12-03825.